Philosophy of Science Portal: Einstein, blackholes, and "firewalls"
"New York Times Wants to Fight Einstein, Einstein Declines"
The Albert Einstein of the popular imagination can seem a bit like Scott Pilgrim, forced into battle with new theories and young physicists. Whether he's pitted against experiments finding faster-than-light neutrinos (a result that turned out to be spurious) or fighting possible alternatives to his theory of gravity, you'd be forgiven for thinking that physics is Albert Einstein vs. the World. 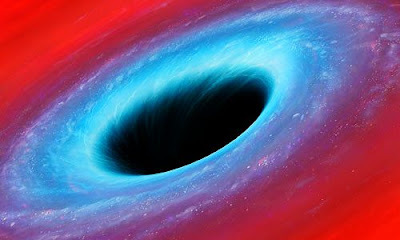 In brief, the general theory of relativity predicts the existence of black holes. If a mass is dense enough, it will be surrounded by an event horizon: a barrier beyond which nothing can escape, including light. Event horizons for practical purposes define what a black hole is, since no experiment can probe inside them. From general relativity alone, an observer falling into a black hole wouldn't notice passing the event horizon. However, if you include heuristic calculations from quantum theory, the energy at the event horizon is high enough to generate pairs of particles and their antimatter partners. The effect could create a “firewall,” a violent region that would destroy anything passing through it on its way into the black hole. Firewalls create a paradox, though. If they exist, they potentially violate the central tenet of general relativity—the equivalence principle—or they cause problems for the conservation of information, an important principle in quantum physics. It's deep stuff, even for someone like me trained in general relativity and quantum field theory; I recommend reading these explanations by Jennifer Ouellette for Scientific American and by Zeeya Merali for Nature. However, it's important that we not overstate the potential implications. Even if general relativity is violated by firewalls, the theory still holds in a vast majority of other situations. Newtonian gravity is used for most applications in astronomy, from planet orbits to the structure of galaxies; general relativity explains why Newtonian gravity works in those contexts, so we're OK with using the simpler theory. Nobody sensible believes general relativity is the last word on gravity, if for no other reason than we lack a complete quantum theory of gravity. If firewalls point to a new theory, we'll likely still use Einstein's theory in the domains where it works, just as we use Newton's. "A Black Hole Mystery Wrapped in a Firewall Paradox"
Being incinerated as you entered a black hole would certainly contradict Einstein’s dictum of no drama. If this were true, you would in fact die long before the bungee-jumping ride ever got anywhere close to the bottom. The existence of a firewall would mean that the horizon, which according to general relativity is just empty space, is a special place, pulling the rug out from under Einstein’s principle, his theory of gravity, and modern cosmology, which is based on general relativity. This presented the scientists with what Dr. Bousso calls the "menu from hell." If the firewall argument was right, one of three ideas that lie at the heart and soul of modern physics, had to be wrong. Either information can be lost after all; Einstein’s principle of equivalence is wrong; or quantum field theory, which describes how elementary particles and forces interact, is wrong and needs fixing. Abandoning any one of these would be revolutionary or appalling or both.